Flow cytometric analysis of U-937 cells (blue) and RPMI-8226 cells (green), using Aiolos (D1C1E) Rabbit mAb (Alexa Fluor® 647 Conjugate). Aiolos (D1C1E) Rabbit mAb (Alexa Fluor® 647 Conjugate) recognizes endogenous levels of total Aiolos protein. Monoclonal antibody is produced by immunizing animals with a synthetic peptide corresponding to residues surrounding Pro46 of human Aiolos protein. This Cell Signaling Technology antibody is conjugated to Alexa Fluor® 647 fluorescent dye and tested in-house for direct flow cytometric analysis in human cells. This antibody is expected to exhibit the same species cross-reactivity as the unconjugated Aiolos (D1C1E) Rabbit mAb #15103. Aiolos is an Ikaros family transcription factor composed of several zinc fingers that mediate DNA binding and homodimerization or heterodimerization with other Ikaros family members (1). Multiple Aiolos isoforms are generated through alternative splicing of the portion of the transcript encoding the amino-terminal zinc fingers (2). Aiolos is expressed by lymphoid tissues, with highest expression levels seen in mature B and T cells (1). Ikaros family proteins control lymphocyte development by recruiting chromatin remodeling complexes to DNA (3). B cells from mice lacking Aiolos have a reduced threshold for activation, increased proliferation, and elevated levels of IgG and IgE. In addition, Aiolos null mice develop B cell lymphomas (4). In T cells, Aiolos contributes to Th17 cell differentiation by suppressing IL-2 expression (5). Aberrant expression of Aiolos in transformed epithelial cells promotes anchorage independence through downregulation of adhesion-related genes (6). Alterations in the Aiolos gene are observed in near haploid acute lymphoblastic leukemia, and the genetic locus containing Aiolos is linked to increased susceptibility to rheumatoid arthritis and systemic lupus erythematosus (7-9). Morgan, B. et al. (1997) EMBO J 16, 2004-13. Liippo, J. et al. (2001) Eur J Immunol 31, 3469-74. Kim, J. et al. (1999) Immunity 10, 345-55. Wang, J.H. et al. (1998) Immunity 9, 543-53. Quintana, F.J. et al. (2012) Nat Immunol 13, 770-7. Li, X. et al. (2014) Cancer Cell 25, 575-89. Holmfeldt, L. et al. (2013) Nat Genet 45, 242-52. Kurreeman, F.A. et al. (2012) Am J Hum Genet 90, 524-32. Lessard, C.J. et al. (2012) Am J Hum Genet 90, 648-60. 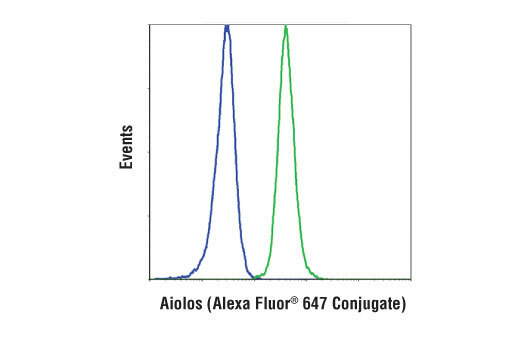 The Alexa Fluor dye conjugates in this product are sold under license from Life Technologies Corporation, for research use only excluding use in combination with DNA microarrays and high content screening (HCS).